Submitted by lynn on Saturday, October 10, 2015 - 7:20pm. At my day job, my office is relatively close to the kitchenette. Every time I enter that area, I eye the huge snack box by the microwave. It's filled with candy, cookies and other snacks for 75 cents but I typically resist the urge for sugary, processed food. Some days though, I give in because I'm going snack-crazy and I don't even know what I should be snacking on instead. My eyes totally lit up when I found this email for doing a product review on Golden Island Jerky. Snacks are constantly evolving to meet the newest food trends and the addition of protein is one of those positives I can see myself agreeing to! 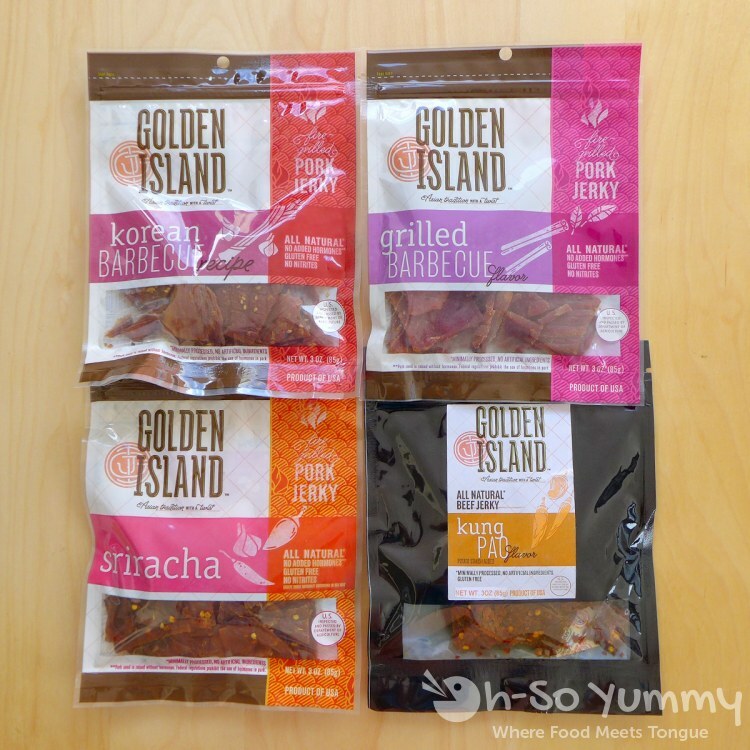 Golden Island pitches their products as handcrafted and gluten-free as well as individually sliced and marinaded. These are then fire-grilled or kettle-cooked to maximize their intense flavors and bring out a moist, tender texture. No nitrates are added. This all-natural product was already sounding way better than the sugar highs staring me down at the office. The company sent me a few of their new flavors to sample, which included korean barbecue, grilled barbecue, sriracha, and kung pao varieties. A lazy Sunday afternoon made for the perfect setting for photos and jerky sampling. 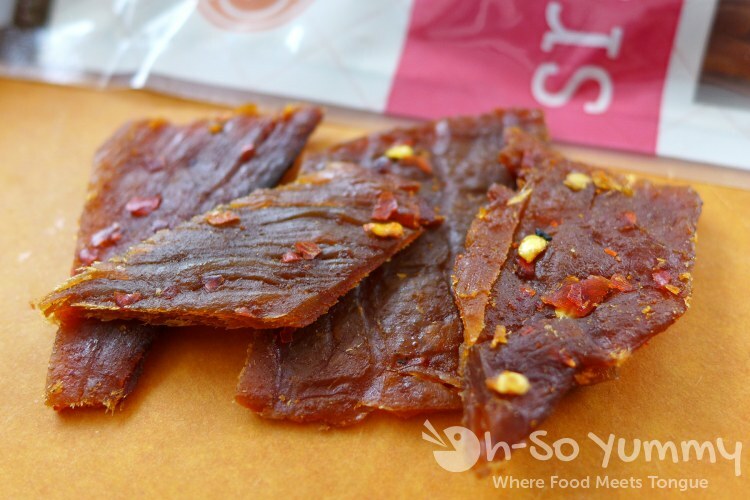 Sriracha Barbecue Pork Jerky: subtly hot, with bold flavors of red chiles and garlic. Sriracha is something I usually avoid like the plague but I still gave this one a try. It has that characteristic sriracha taste to it but didn't bring the heat I feared, despite having a few sparse specks of red chile flakes. I like that these jerkies aren't sticky, compared to our last buy from the asian jerky stores in OC. Specifically, the ones where you leave with $50 less in your pocket than intended because those women offer you many samples and you can't seem to say no. True story... or at least, it happened to us and my nephew Mike. No pressure here! 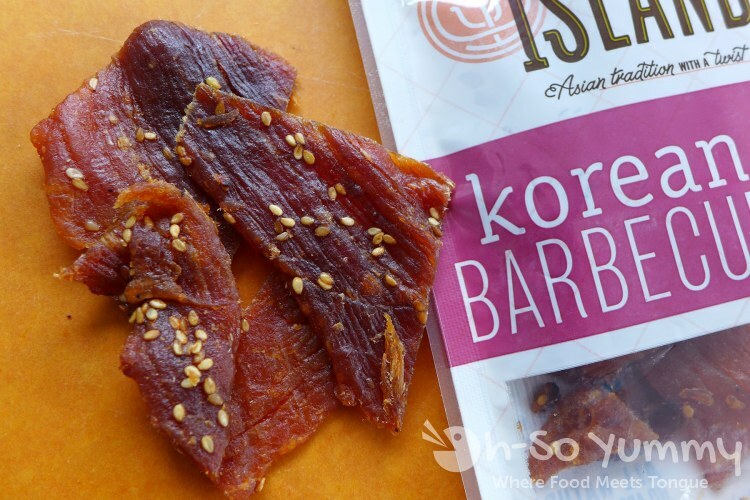 Korean Barbecue Pork Jerky: savory, with intense flavors of sesame and spices. This one turned out to be my favorite flavor. It has a bit of that sweet and salty marinade which subtly reminded me of the meats from places like Manna BBQ. I also enjoyed the texture of the sesame seeds in each bite. 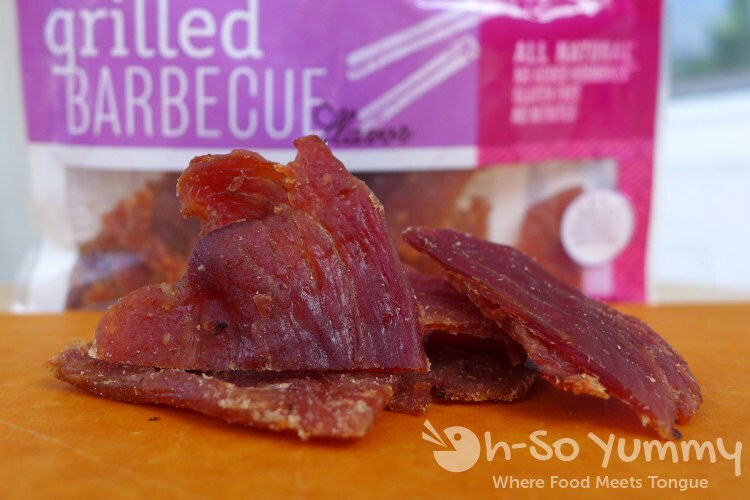 Grilled Barbecue Pork Jerky: sweet, with a hint of cinnamon and spices. This one looks the simplest, with no extra adornments. It also unfortunately was my least favorite. The flavor is a bit like honey in that barbecue setting but I think a bolder taste would have been more favorable. Also, when comparing to the rest of the samples, this definitely didn't leave an impression. I'm pleased with the pork jerky tasting overall. I've only had beef jerky so I was really curious how they'd turn out. I like how the pork jerky is much softer and not so chewy as some beef jerkies I've tried. 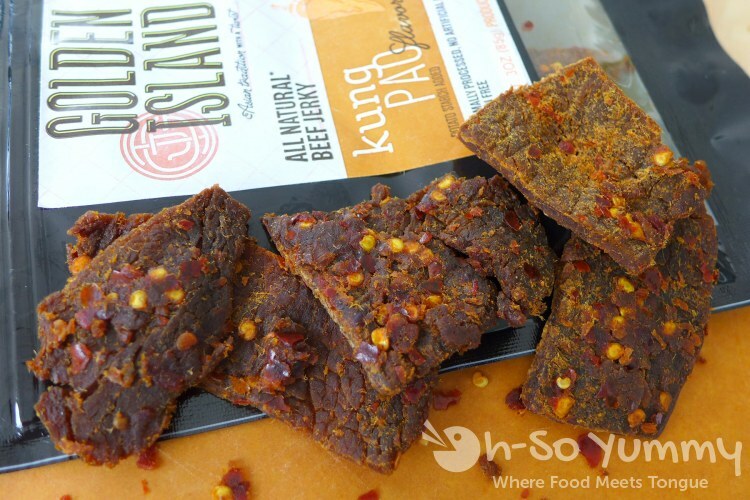 Kung Pao Beef Jerky: spicy, soaked in a blend of Asian-inspired spices and topped with chili flakes. The beef jerky seemed to be a little stiffer than the pork jerky but was still flexibly biteable. The chili flakes on top of this jerky did give that chili heat that was enough to make me call it quits after finishing one piece. That is, until my mouth had forgotten the touch of fire and I was reaching for another one. Because it is NOT saucy hot, I felt like I could go back again and again to this. Fresh out of the bag, all these jerkies were still supple and easy to bite. Unopened, these are good for approximately a year after being manufactured. As for how long they last after being opened, I don't think mine made it past the 3 day window because they were all gone before then! How would I rank these flavors? My favorite was korean barbecue, followed by sriracha, kung pao, then last would be grilled barbecue. That particular sweet just did not do it for me but I did like the rest. In stores, Golden Island Jerky is currently available at Costco Wholesale, World Market and Ralphs groceries throughout Southern California. Online, the Golden Island website has a club size of 14.5 oz for 12.99 but only sell two flavors, the grilled barbecue and the korean barbecue flavors. Give it a try and let me know what you think! Disclaimer: We were provided this product for review but the opinions remain our own. i did 2 today (ironside and la puerta). first yelp reviews ever. go me! Good job! :-) See you on the 29th! Korean BBQ jerky sounds awesome sauce. I would keep that chili flake one away from me or give it to someone else. Too many chili flakes! i tried eating more of the sriracha one (also with chili flakes) and decided it's too spicy for me in general too. i guess i gotta stick with the savory flavors instead!